Background: Transplant renal vein thrombosis (TRVT) is a severe vascular complication and is caused by various factors, including recipient factors, donor factors, immunosuppression regimens, and surgical techniques. Despite adequate interventions, including thrombolytic therapy or surgical thrombectomy, successful salvage of the allograft is often difficult. We observed a case of TRVT induced by compression of the renal vein immediately after intraoperative abdominal closure. Case presentation: A 41-year-old male underwent ABO-compatible living kidney transplantation. The donor was his 45-year-old sister, and her right kidney was donated. The allograft had a single artery and vein. One of the preoperative recipient problems was obesity (body mass index, 33.4 kg/m2). Intraoperative Doppler ultrasonography (US) revealed sufficient blood flow throughout the allograft, and urine output was also observed. After surgery, hematuria was observed; the urine output decreased and serum creatinine levels increased to 7.0 mg/dL. Doppler US showed a decrease in diastolic flow and an elevated resistive index, which were similar findings to those noted in acute rejection. Although steroid pulse therapy was initiated, allograft dysfunction was worsening. On postoperative day 4, surgical exploration revealed TRVT; consequently, thrombectomy was performed. The urine output increased, and serum creatinine levels decreased to 1.8 mg/dL. 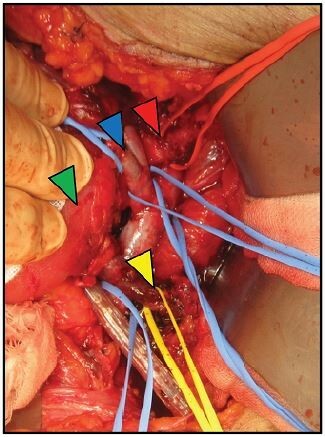 The cause of TRVT development may be that the transplant renal vein was relatively short, due to the right kidney being compressed by surrounding tissues after abdominal closure, and that TRVT was gradually developing due to stagnant blood flow. Conclusion: Although TRVT is induced by multiple factors, an accurate diagnosis is often difficult. Understanding these factors, including obesity, and considering TRVT as a cause of allograft dysfunction are important during the pre-, peri-, and postoperative periods. Knowledge of TRVT can lead to early and accurate diagnosis and intervention, resulting in better outcomes for the patients with allograft dysfunction.